Thomas Leathes Stanger Leathes died at Elm Bank in Lillington, Warwickshire on June 19th 1876. He is commemorated in the stained glass window installed in St John’s-in-the-Vale church in 1895 by members of his family. He had not lived all the year round at Dale Head Hall for a long time, and the house was largely occupied by the servants who looked after it in his absence. His son Henry Stanger Leathes, a Lieutenant in the Bengal Artillery had been killed on 29th December 1843 at Maharjpore, in India “at the taking of the fortress of Gwalior.” He was buried on the battlefield, and is commemorated on a memorial in St Mary Abbotts Church, Kensington. Dale Head Hall was left to another son, George Stanger Leathes, who had lived in Australia for some years. He returned to England, and on the 29th December, 1879, Dalehead Hall was sold to Manchester Corporation for £27,250, this being the value of the estate after assessment by two “able, practical Surveyors, one nominated by the Vendor and the other by the Corporation”. 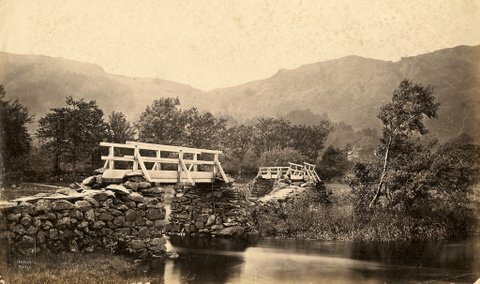 Photo Dale Head Hall c. 1890 from “History and Description of the Thirlmere Water Scheme” by Sir John James Harwood, 1895. So Manchester acquired “all the estate called Dalehead in the County of Cumberland with the Mansion House, farm lands, woods and under-woods, rights, members and appurtenances thereunto belonging, and also those two pieces of land covered with water forming an upper and a lower Lake, and known by the name of “Thirlmere” or “Leathes Water”, the Manor of Legburthwaite, the Mill with the yards and appurtenances, and the plantations situate in the Vale of Saint John”. The Leathes family had been at Dale Head for over three hundred years. In 1557, Adam Laythes had purchased the Manor for £477. One writer states that “Dale Head Hall had originally been a fortified tower, altered into an elegant house by the owner, Adam Laythes.” Another describes it as “a small Lakeland manor house which grew up, over and around a sixteenth century statesman’s home.” Whatever the case may be, when Manchester Corporation relinquished their ownership, the Hall had remained largely unaltered from the time that they acquired it. A copy of “The Heads set out by a Jury on Wythburn, October 29th Anno Domini 1606” included Christopher Leathes among the 12 Jurymen. This document set out the limits of the various stinted areas on the Wythburn fells. The same, or another family member called Christopher Leathes, used to be named in a stained glass window of 1623 over the magnificent old oak staircase, but this window is no longer there. Forty years on, a later descendant, Thomas Leathes, was visited by George Fox in 1663 who said that “we had a fine opportunity to be refreshed together” which points to Thomas having become a Quaker. Joshua Leathes was one of the Wythburn Chapelmen in 1700, and in 1753, Mr Leathes is recorded as paying his contribution to the Chapel Wage of 9 pence three farthings. Thomas West, in his famous Guide to the Lakes written in 1779 judges that the best view of the lake is “from an eminence behind Dale-Head house”. These are a few of the references throughout history testifying to the continuing part the Leathes family and Dale Head Hall played in the life of the valley. When Manchester sought to buy the Thirlmere land they had to deal with two Manors: the Manor of Wythburn and the Manor of Legburthwaite. The Lord of the Manor of Wythburn was Sir Henry Ralph Vane who lived at Hutton Hall. He was primarily concerned that his rights to shoot and fish should not be disturbed, and was ready to sell as long as these could continue until he died. Formerly the Manor had been owned by the Braithwaite family of Warcop, and was sold by them to Sir George Fletcher of Hutton Hall, ancestor of Sir Frederick Fletcher Vane. There seems never to have been a Manor House at Wythburn. Sir Henry received £52,000 after negotiation, and although this was far less than the Countess Ossalinsky managed to squeeze out of a reluctant Manchester (over £77,000), it makes the Dale Head estate seem cheap at the price. 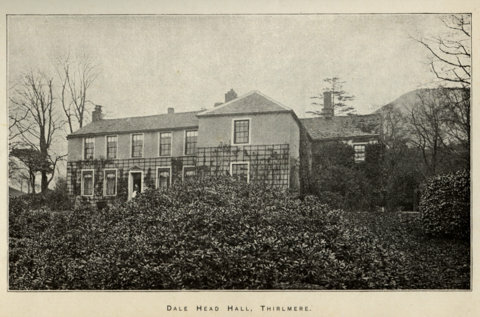 Dale Head Hall was retained by the Corporation as a place where guests could be offered hospitality, and within recent memory, the Lord Mayor regularly visited the Hall for his summer holidays, and his wife opened the annual Thirlmere Flower Show. Part of the Hall at the rear was the farmhouse which in 1841 was lived in by Daniel Thwaites, a widower and farmer, aged 65, and his four grown up children. The 1851 Census tells us that he farmed 150 acres of the Estate Farm. By 1871, his son Reuben had taken over and was farming 172 acres. His wife Elizabeth is mentioned by J J Harwood in his “History and Description of the Thirlmere Water Scheme”, who writes that “on subsequent visits to the district…..we went to look at the Lake, but were ordered off several times by Mrs Thwaites the wife of the farmer at Dale Head Farm.” This house has now been assimilated into the Hall as part of the accommodation. During the time that Manchester owned the Hall, the farmhouse continued as part of the pool of property available to local people. Mr and Mrs Frank Swainson, and Mrs Swainson’s father, Ernie Brownrigg, MBE., the famous West Head shepherd, were the last occupants before the Hall changed hands. One distinguished former resident of Dale Head Farm was Peter Crosthwaite (1735 – 1808), who was born there and spent his childhood there. He later became the founder of Keswick’s first museum, and was a map maker and inventor. Manchester Corporation passed on its responsibility for Thirlmere to North West Water Authority in 1974, which in turn became North West Water plc in 1989. Dale Head Hall was no longer needed and was sold in 1989 to John and Helen Davenport, who began the process of converting the hall into a hotel. Since then it has been enlarged by subsequent owners with the addition of a new wing, and the old stables have become self-catering units. One thing remains the same: the magnificent situation on the shore of a much changed Thirlmere, but the view across the old Wath bridges to Armboth House, sadly, has gone forever. Photo –Frith’s Series - The Wath bridges from Dale Head Hall foreshore. Armboth House can just be seen among the trees.